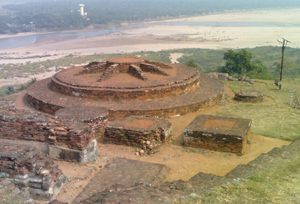 A historically renowned village lying atop the hill on the south bank of vamsadhara River about 9 miles from Srikakulam town, Salihundam is a noted Buddhist place that allures the folks from every nook and corner of the world. There are numerous Buddhist stupas nestled on a hill amid the picturesque surroundings. These are deemed to be erected in 1919 by Gidugu Venkata Rama Murthy. Four stupas, Relic caskets and architectural shrines were discovered during diging performed by the state authorities. All of the remnants were built between 2nd century and 12th century reflecting different times of Buddhism - Mahayana, Theravada and Vajrayana. In addition to this, the sculptures of Mareechi and Tara were also found from this notable site. It is indeed one of the main Buddhist excavations standing as evidence of the religion thrived at this place during 2nd to 3rd century. It is certainly the best place to pay a visit while on a tour to Salihundam.